Networking has emerged as one of the most rewarding and lucrative career options in recent times, especially for students of B.Tech, BCA, and MCA background. However, students from other streams can also take networking as a career if they have interest in the same. As we all know passing Cisco Certifications is the best way to make a successful career in networking. The choice of technology or track should be dependent upon candidate's interest, demand, and scope in the job market. Among fresher students coming to Network Bulls routing & switching and security are the most popular technology tracks as a career choice. But most of the candidates get confused which one to choose? Today we will solve this doubt once for all !! Before that let's see a quick overview of Network Bulls. So this was a quick overview of Network Bulls. Now coming back to which Cisco Certification Track to choose, let's assess - Market demand for CCIE R&S and CCIE Security Engineers, Salary for CCIE R&S and CCIE Security Fresher Engineers, Job roles after CCIE Security and CCIE R&S, and carer growth in 10 years span for CCIE R&S and CCIE Security. 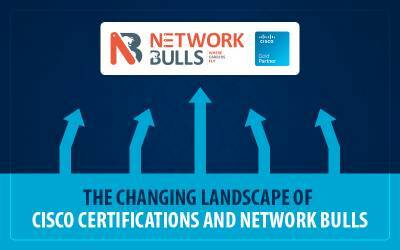 First, take a look at what you will learn in both Network Bulls' courses. 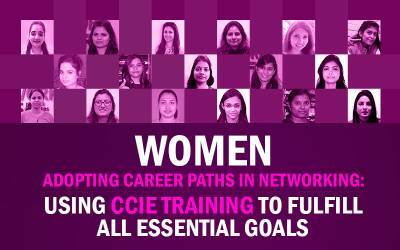 CCIE R&S Integrated course offered by Network Bulls is a shortcut to success program. It covers CCNA R&S, CCNP R&S, CCIE R&S, Advanced BGP and Advanced MPLS Training. It’s a perfect course for freshers willing to build their career in Cisco Networking and kick-start their career as proud Cisco Network Engineers. After doing Network Bulls' CCIE R&S Certification course, you will be able to design, implement and troubleshoot complex Cisco Networking and will be able to work in an MNC as a Cisco Network Engineer. CCIE Security Integrated course offered by Network Bulls is a perfect combination of Cisco Routing & Switching and Security technologies. It’s an amazing combination of CCNA R&S, CCNP R&S, CCNA Security, CCNP Security, CCIE Security and Multi-Vendor Firewalls. In this course, you will not only learn How to Design and Implement Cisco Networks, you will also learn How to Secure Cisco Networks using high-end Cisco Security Appliances such as Firewalls, IPS, IronPorts and more. 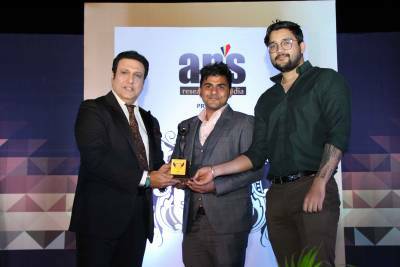 After completion of CCIE Security Training in Delhi/Gurgaon from Network Bulls, you will be absolutely ready to work as Network Security Engineer or Network Engineer in an MNC. CCIE Routing & Switching is most famous CCIE track and there are only around 35,000 CCIE R&S Certified Engineers in the entire world whereas world needs over 3,00,000 CCIE R&S Engineers right now. CCIE Security, on the other hand, is the most reputed and highest paid IT Certification ever. If you are a CCIE Security Certified Engineer, then you are one of those 6,000 Network Security Superheroes who is cut above the rest. You will be amazed to know that there are not more than 6,000 CCIE Security certified Engineers worldwide, whereas industry needs over 2,00,000 CCIE level Security Engineers right now. 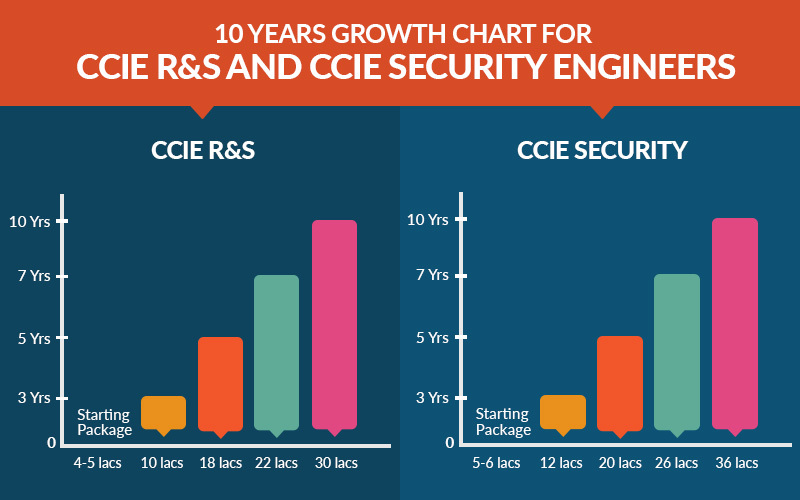 If you are a CCIE R&S Certified engineer, you can easily start your career at 4-5 lacs package and reach up to 30 Lacs package within 10 years. If you are a CCIE Security Certified Engineer, then you can easily kick start your career from 5-6 lacs package and reach up to 36 lacs package with 10 years of hard work. So, with above-given information students can easily identify which track suits them the most. While selecting a track we also recommend discussing it with career experts or trainers which are easily available at Network Bulls. Keeping course content, job roles, career growth scope and your interest; you can select any of the two CCIE Integrated Courses at NB to make your career fly. Network Bulls offers Cisco Courses Customized for fresher students which allow them to learn everything from the beginning as these courses cover all Cisco Certification Levels - CCNA, CCNP & CCIE. 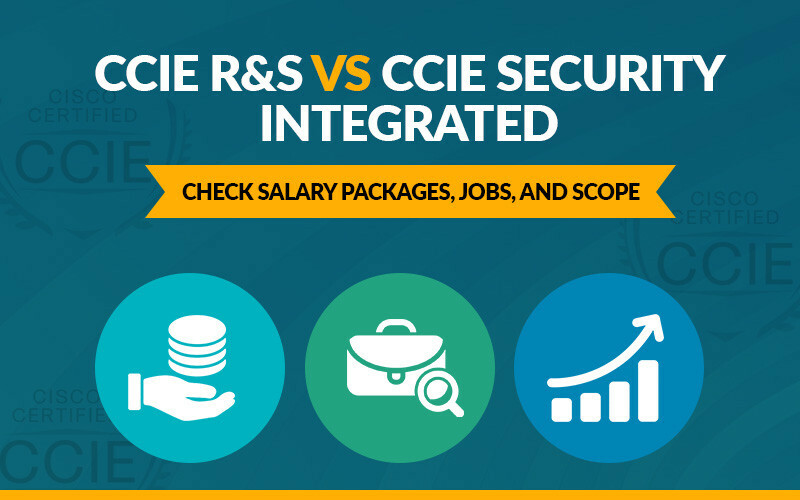 Choosing from CCIE R&S Integrated v/s CCIE Security Integrated Course is one of the dilemma almost every networking candidate faces. Consider factors like course content, job roles after CCIE, and salary growth in the span of 10 years before making your mind. 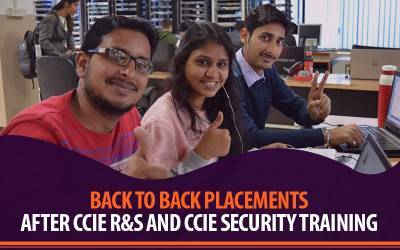 CCIE R&S Integrated is one of the most popular courses for fresher students, whereas CCIE Security Integrated is the most reputed one. We also recommend discussing with your peers, career experts or trainers before making a final selection.